Expanded polystyrene (EPS) should not be submitted to temperatures in excess of 175°F. Not all chemicals and other media are compatible with EPS, including some solvents that will attack/degrade EPS. For a complete listing, click here. In the past, preparing a site for above ground storage tank placement included pea gravel installation. While this method appeared more cost effective, over time the gravel was inevitably exposed to leaks and spills. 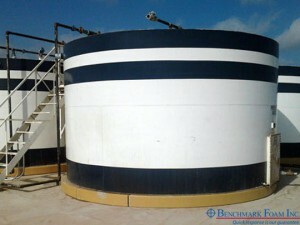 Do away with costly remediation by using Benchmark Foam’s environmentally friendly Interlocking Tank Pads (US Patent No. D664,626 S and No. D669,153 S). Installed on minimally prepared ground, they not only ease site preparation and reduce setup costs, but their surface is easily cleaned. Every Benchmark Foam Interlocking Tank Pad is encapsulated with a two-component, rapid curing polymer coating. The signature design consists of three interlocking parts that eliminate strapping. All parts are universal, able to be interchanged as required, allowing for ease of shipping and installation. Accidents happen. For times when Benchmark Foam Interlocking Tank Pads are jeopardized, there is an easy solution to patching the polymer hardcoat onsite. Patch Kits are available for overnight shipping so, if required, damages can be repaired to avoid any further complications. To ensure the longevity of Benchmark Foam Interlocking Tank Pads, regular inspections are encouraged to maintain form integrity. 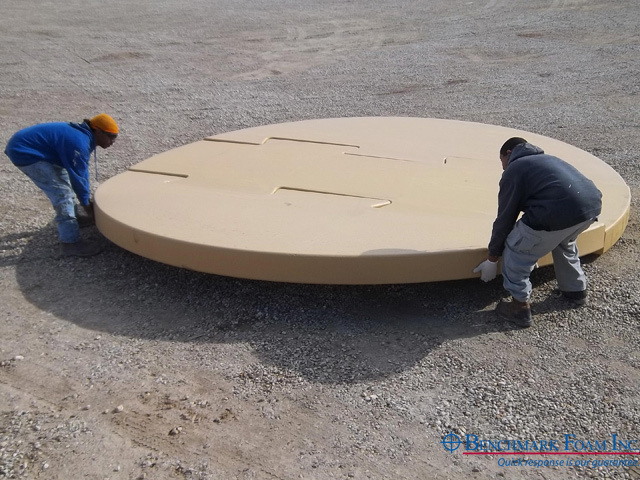 Benchmark Foam’s patented interlocking Tank Pad design includes a feature that increases the thickness of sprayed polymer coating on every edge of each tank pad part. This feature eliminates coating sag at sharp, 90° edges that produces a decrease in coating thickness – a decrease that can result in pad failure and costly subsequent repairs to tank batteries. Additionally, to reinforce and achieve increased edge strength, Benchmark Foam Interlocking Tank Pads are created with a radius on every corner. During the manufacturing process, the radius edge ensures even application of our signature sprayed polymer coating. 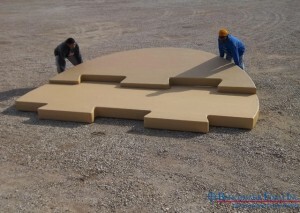 For the customer, this means a stronger, more durable tank pad that will continue to protect and preserve over time. To ensure consistent quality and durability, Benchmark Foam interlocking Tank Pads are produced to proven specifications (Geofoam Specification ASTM D6817-15). 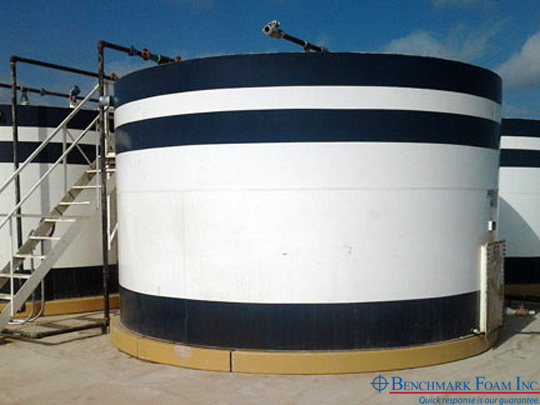 All Interlocking Tank Pads manufactured by Benchmark Foam are thoroughly tested and recorded by an internal Quality Control program to ensure consistent amount of polymer coating material is used on each tank pad. 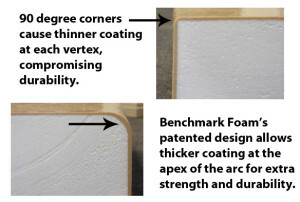 For more than 25 years, Benchmark Foam has manufactured high-quality, durable expanded polystyrene (EPS) products with more than 20 years experience spraying fast setting urethane coatings. Benchmark Foam is dedicated to serving the industry and the environment by helping reduce site preparation and impact. Save money and protect your assets with Benchmark Foam’s proven Interlocking Tank Pads. Avoid the bitterness of poor quality by enjoying the benefits of our consistently durable, re-useable products. Read, download or print our Tank Pad brochure.